The climate may be changing but the grooves remain rock steady as Keep It Disco returns to the Oxford Art Factory basement for an evening of sweltering disco power. With the forecast predicting a sizzler, cut loose, cut sick and cut shape with Sydney’s super selectors Sidehustle DJ’s and Maia Bilyk. Find yourself a friend and get down Friday March 15th. Whether your intentions are to pursue a career in dance or simply enjoy a fun hobby, Keep It Disco has your groove quota covered. Prepare your senses for a night of groove tooting wonderment as the boogie zone descends on the Oxford Art Factory Basement. Suit up in your Friday best for an effing good time courtesy of Sydney’s supreme Disco duo Brudo & Hux. Find yourself a friend and get down Friday January 25th. Save the date as Keep it Disco drops back into the Oxford Art Factory for yet another night of dance and romance. Catch Sydney’s premium Disco duo Brudo & Hux from start to finish as they delve deep to present their favourite disco treats. Find Yourself a friend and get down Friday December 7th. Prepare your senses as Keep it Disco drops into Freda’s Bar for an all night affair of top shelf disco and uninhibited self expression. Remembered only through thick haze and the call of the disco ball, cut sick, cut shape and cut loose with Sydney’s premium Disco duo Brudo & Hux. Find yourself a friend and get down Saturday night October 20th. Grab a party hat and save room for cake as Keep it Disco return to the Oxford Art Factory basement for their 3rd birthday blow-out. Three rotations around the sun later, feel the force as Sydney’s premium Disco duo Brudo & Hux return to the stage to present their favourite disco treats in a long overdue game of pass the parcel. Find your self a friend and get down Friday August 17th. 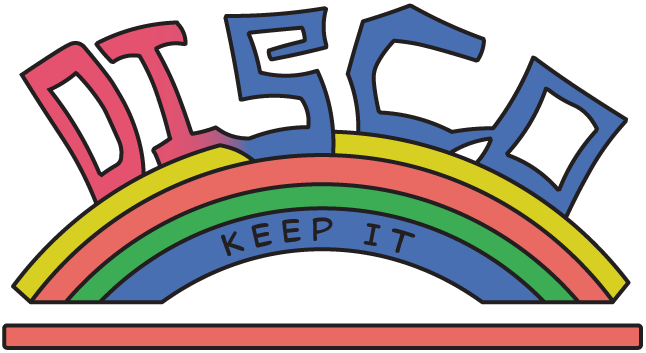 Pull out your file-o-fax and save the date as Keep it Disco returns to the Oxford Art Factory basement for another night of dance and romance. Bringing the business of boogie down underground, forget your Opal card as this is your one way ticket for the soul train that runs non-stop, all stations, to a good time. But who’s conducting loco locomotive of love? Lauren Hansom and Mike Who? No that’s his name, but don’t be confused, these supreme selectors stick to a strict of agenda of loose joints and bouncing booties. Find yourself a friend and get down Saturday night, July 7th. Prepare your senses as Keep it Disco returns to the Oxford Art Factory basement for an all night affair of top shelf disco and uninhibited self expression. Cut sick, cut shape and cut loose when Sydney’s premium Disco duo assemble the ultimate boogie zone, complete with an XL mirror ball exposé and haze to suit. Then be ready for some double-a-disco when Sydney’s Ariane & Anno (Lovebombs) join forces as your “Double A” duo with the finest selections in tale. Find yourself a friend and get down Saturday night May 19th.